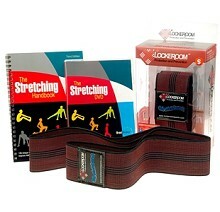 The Ultimate Stretching Pack - HealthLife.com - Where Health, Life and People Meet! The Ultimate Stretching Pack gives you the option of purchasing The Stretching Handbook, The Stretching DVD and StretchBand as a pack. By purchasing The Ultimate Stretching Pack you'll save nearly $8.00 as compared to purchasing the Handbook, DVD and StretchBand separately. Plus you'll also qualify for free shipping and save another $7.95, for a total saving of nearly US$16.